[prMac.com] Perg, Austria - Ergonis Software today announced the release of Typinator 6.3, a new version of their popular text expander. Typinator 6.3 comes with a handy new feature that lets you search for the most recent expansions, both in the find field in the Typinator window and in Quick Search. Finding recent expansions can be very helpful if you realize an unexpected expansion while typing and you don't know which abbreviation triggered this expansion. Now you can enter "last" in the find field, and Typinator will show the abbreviation that triggered that latest expansion. Typinator also accepts "recent" and "latest" as the keywords for this search function (in German "letzte", "letztes", "letzte"; in French "dernier", "derniers" and "recent"). You can also extend your search to more than just the latest expansion. For example, "recent 5" finds the five most recent expansions. Export of sets has been improved as well. With the new version, dragging one or more items from the abbreviation list into a Finder window now exports a set containing just the selected items. Until now, exporting was possible only for whole sets. The new version also comes with an improved appearance, particularly on Yosemite. With a new technological basis (new compiler, new libraries, faster code, etc. ), Typinator 6.3 is faster, more robust, and more responsive than ever. Many more improvements and enhancements are included in this new version. Visit Ergonis Software's website to view the full list of changes and to download a trial copy. Typinator 6.3 requires Mac OS X 10.6 or newer and is fully compatible with OS X Yosemite (10.10). The usage of regular expressions requires Mac OS X 10.7 or newer. Typinator can be purchased securely on the Ergonis Software website. 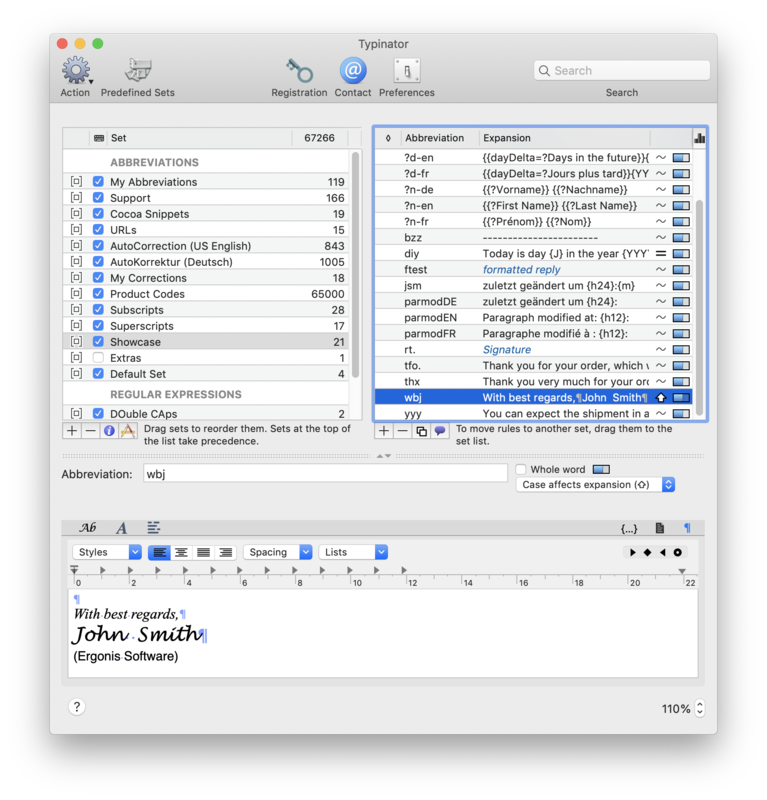 The upgrade to Typinator 6.3 is free for anyone who owns a license for Typinator 6 or purchased a license for Typinator 5 on or after October 1st 2013. Upgrade paths are available for customers who purchased their license before October 1st 2013. All customers who purchase an upgrade or a new license for Typinator 6 will get all subsequent 6.x updates for free. For information about purchases, including enterprise licenses, volume discounts, and upgrade pricing offers, see the company's web site. Headquartered in Perg, Austria, Ergonis Software Gmbh is a privately held software development company founded in 2002. With a focus on innovation, Ergonis develops ergonomic and intuitive software that boosts the productivity of Mac and PC users alike. Copyright 2002-2014 Ergonis Software Gmbh. All Rights Reserved. Ergonis products are either registered trademarks or trademarks of Ergonis Software GmbH. Other company and product names may be trademarks of their respective owners.